I'd hit it. With a crowbar. Do they actually think that this makes them look attractive? They would look awesome in an anime...nope, not even then. Just so you know girls, you're not vampires or demons etc. What you are, is you are going to regret this in about 20 years. THESE LUMPS! I KNOW YOU WANT SOME! THESE LUMPS! BUT YOU CAN'T CAUSE YOU'RE A CHUMP! That's not funny that's how my family died. It's amazing what they do to stay "beautiful"
I want that makeup too.......................................................................................just kidding. No, only the water injections are temporary. What about the dozen other freakish demonic hell-pig things that they have done to them?!! The fangs, the one missing iris. 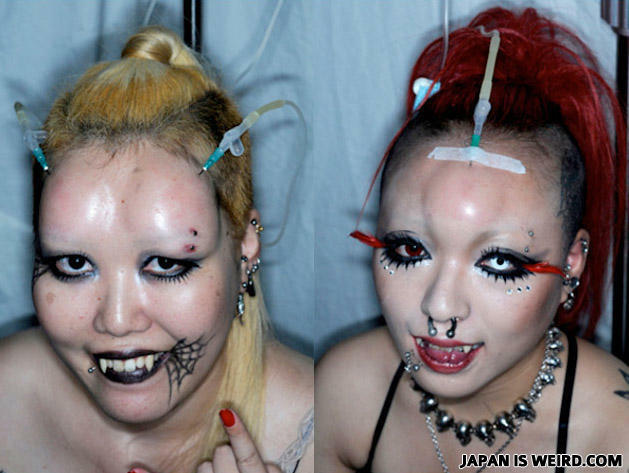 the makeup looks like freak schizo goth makeup on heroin. The tattoos, and the piercings. I'm probably missing something. If you dumb fooks keep swearing we are going to get banned.